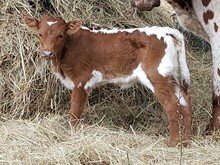 This little 1/2 butler heifer has Starlight, Tari Graves and Delta Rockett in her pedigree. What a genetic goldmine. When her horns roll over she is going to be special.